Eye injuries in sports, especially youth sports, are worryingly common and often involve activities that most of us probably would not consider risky for eyes, according to a new, nationwide study of emergency room visits related to eye problems among athletes. 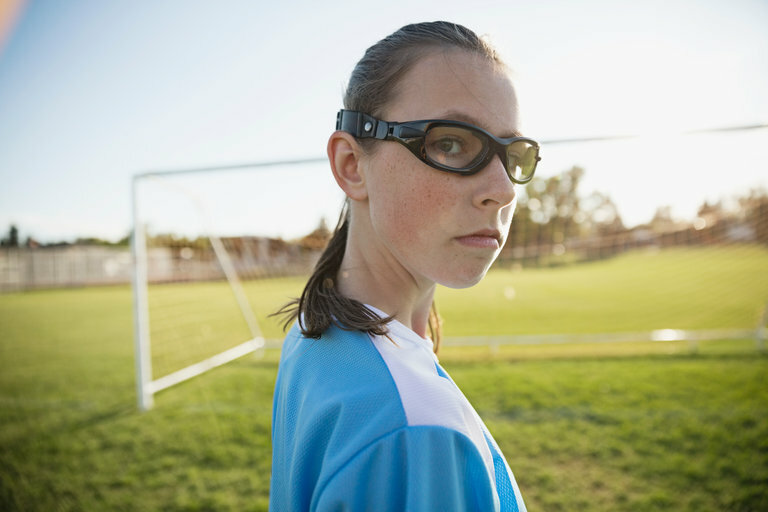 The results suggest that anyone involved with youth sports should be vigilant about protecting young people’s eyes, perhaps in part by stocking up on wraparound glasses. Team sports and other physical activities, while providing many health benefits, also carry an inherent risk of injury. Even experienced athletes can slip, stumble, collide with balls or posts or opponents or teammates or the ground, and in multiple other ways, harm themselves. The rise in recent years in serious sports injuries, including concussions and tears of the anterior cruciate ligament in the knee, has been well documented and unsettling to those of us who are sports parents. But far less attention has been devoted to eye injuries, even though eyes can be especially vulnerable during sports. They tend to be facing directly into the action and have little natural protection against pokes or flying objects. So for the new study, published recently in JAMA Ophthalmology, researchers from Johns Hopkins University, Harvard and other institutions decided to delve into data from the Nationwide Emergency Department Sample, which compiles information about millions of emergency room visits to more than 900 hospitals around the country. The database offers a representative sampling of visits to the approximately 5,000 emergency rooms in the United States. Beginning in 2010, these hospitals began using a detailed set of new medical codes to describe why people had visited the emergency room. These codes specified, among other information, what sport someone had been playing when he or she was hurt, as well as what kind of injury had occurred. The researchers gathered all of the data involving eye injuries from 2010 through 2013, and then zeroed in on injuries that, according to the coding system, had occurred during sports or physical activities like recreational cycling. They then organized the resulting statistics according to the age of the person with the injured eye, the activity involved and the severity of injury. The results are perhaps not suitable for the squeamish but are important for anyone who works with young athletes. About 30,000 sports-related eye injuries were treated each year at the emergency rooms participating in the database, the researchers found. A large majority of these injuries occurred in people younger than age 18, and quite a few in children younger than 10. The sport most likely to result in harm to the eye was basketball, the researchers found, accounting for more than a quarter of the injuries. Baseball and softball were, together, the second most common cause, followed, among boys, by air guns. Football resulted in few eye injuries, probably because players wear full-face helmets. But to the surprise of the researchers, cycling was one of the most frequent contributors, as was soccer, especially among girls. Eye injuries were not always the primary reason someone visited the emergency room. Sometimes the eye problem was part of a larger accident. Someone would fall from a bicycle, for instance, and scrape her face along the pavement, causing multiple lacerations, including to the eye. Thankfully, most of the injuries were relatively minor, including cuts and bruises around the eye or on the eyelid. But some, such as fractures of the bones housing the eyeball, common during baseball and air-gun play, required surgery and potentially threatened young athletes’ vision. “Sports-related eye injuries can be quite serious,” said Dr. R. Sterling Haring, a doctoral researcher at Johns Hopkins and the University of Lugano in Switzerland, who led the study. The injuries also are likely to be far more numerous than in this study, he said. “We had data only from emergency rooms” and not visits to eye doctors, urgent care facilities or general practitioners, he said, which most likely would have doubled or tripled the totals. Based on the study’s results, however, he believes that reducing eye injuries among athletes could be both relatively easy and quite daunting, depending on the sport. “One of our most interesting findings,” he said, was that eye injuries were frequent and severe from air guns, but “relatively uncommon with paint guns,” since they are usually used at paintball facilities that require safety goggles. Protecting eyes in a sport like basketball, where wayward fingers and sharp elbows are usually to blame, could be harder, he said. But even then, convincing young basketball players to wear protective glasses with clear lenses might prevent many trips to the E.R. for eye treatment, he said. “Wraparound glasses with shatterproof lenses can keep out a lot of undesirable objects,” he said, including fingers, debris and misdirected curveballs.